I bought a 5 litre basket of plums at the market this week. Plums, the most under rated fruit to cook with if there ever was one. I love how they’re both sweet,and tart with soft flesh that melts in the oven adding moisture and complex flavour to whatever you’re baking, and there’s the gorgeous colour; plum is what aubergine wishes it was. I had already made plum jam, but I wanted something else in the pantry to give as gifts (selfishly saving most of the jam for me). Lucky for me, I had just received my copy of The Canning Kitchen by Amy Bronee, 101 Simple Small Batch Recipes. The book is beautifully photographed, and so far, I’ve made the Salted Caramel Pear Butter (more on that in another post) and today, the Plum Rum Raisin Sauce. It’s a dessert sauce and I’m hoping that on a cold evening in January it will be fantastic on a slice of custard tart. It was delicious when I was scraping out the pan, but I’m hoping that the rum flavour becomes more obvious as it sits. I’m posting the recipe as I made it; more rum, a bit more brown sugar and definitely more cooking time as I had increased the liquid. It’s different, looks gorgeous, and is another addition to the pantry, and I still have plums, even after making a pie, Maybe chutney tomorrow? Wash the plums well, using a sharp knife, slice them in half and discard the stones. Rough chop the plums (I didn’t do this, I should have done this) and place them in a heavy bottomed large pan. 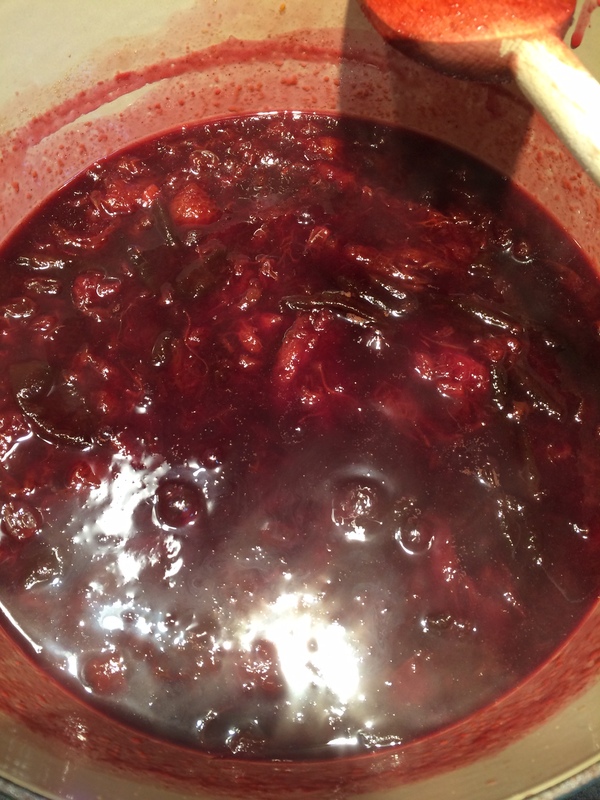 Add the rum and bring to a boil, then turn the heat down and using a potato masher, coarsely mash the plums. Add remaining ingredients ans simmer over medium low hear for approx. 30 minutes or until thick, stir every 5 to 10 minutes to prevent scorching. Remove from heat and ladle into hot, sterilized jars. Process jars at a full boil for 15 minutes. I am a careful “canner,” I always sterilize my jars (I use the oven) and I always process whatever I make. I give away most of what I preserve, just to spread the love.